When you visit the UW Arboretum, you go to take a stroll through the woodlands, prairies, and flowering trees. You go to navigate the boardwalks that wind through wetlands to views of a shimmering Lake Wingra. You go to breathe in the heady scent of the world-famous lilac collection. What you don’t go to do is serve as a taxi for ticks and their pathogens. But if you spend time outside in the summer, odds are you’re acting as an unwitting tick transport — and the odds are increasing. Home to robust populations of ticks and their hosts (namely, mice and deer), Wisconsin — the Arboretum included — has become a hot spot for tick-borne diseases. Over the past 25 years, deer ticks have trekked from the northern parts of the state to the south and east. They are now found nearly everywhere, lurking in the backcountry, in the wooded areas of neighborhoods, and even in well-manicured lawns. Wisconsin residents are also encountering more of another well-known pest — mosquitoes. Last summer, Paskewitz and her colleagues trapped 80,000 mosquitoes in Dane County. That’s eight times more than ever observed previously, a sign that their numbers are growing. The Asian tiger mosquito, a species capable of spreading the Zika virus, was found in Wisconsin last year. In humans, Zika infection often causes mild or no symptoms, but it can lead to pregnancy complications, such as brain malformations in infants. In 2015, an epidemic of Zika broke out, starting in Brazil, where around 1.5 million people became infected. Although the number of cases throughout the Americas has dropped dramatically since 2016, and Zika transmission has not been detected in Wisconsin, the disease has made its way into other parts of the Midwest. As mosquitoes and ticks travel into new territory, exposure to the diseases they carry increases. In 2016, more than 640,000 cases of vector-borne disease were reported nationwide, which is triple the number of cases in 2004. In roughly that same time period, nine new germs spread by bites from mosquitoes and ticks have been discovered or introduced in the United States. In this new reality, scientists, public health officials, industry representatives, and the public are asking how they can be better prepared to respond to ongoing cases and stop epidemics before they start. A new consortium led by Paskewitz and Lyric Bartholomay PhD’04, associate professor in the UW School of Veterinary Medicine, aims to provide answers. The Midwest Center of Excellence for Vector-Borne Disease was established last year with a $10 million grant from the Centers for Disease Control and Prevention to research illnesses transmitted by ticks and mosquitoes (the vectors, in this case) and train new professionals who can stop the diseases from spreading. The center is a direct response to the struggle the U.S. faced when Zika arrived and is part of a system of regional consortia tasked with studying and preparing for vectorborne diseases. These consortia form the basis of a federal plan to build a barricade against what is seen as a rising threat. The investment will allow researchers and public health officials to keep a close watch on a number of pathogens transmitted by ticks and mosquitoes. Lyme disease is the most prevalent tick-borne disease in Wisconsin, with almost 1,500 confirmed cases in 2016 (and many cases go unreported). Spread by deer ticks, the disease causes fatigue, aches, and fevers, which are sometimes — but not always — accompanied by the hallmark bull’s-eye rash. If left untreated, Lyme disease can lead to facial paralysis, nerve pain, short-term memory issues, and a host of other debilitating symptoms. 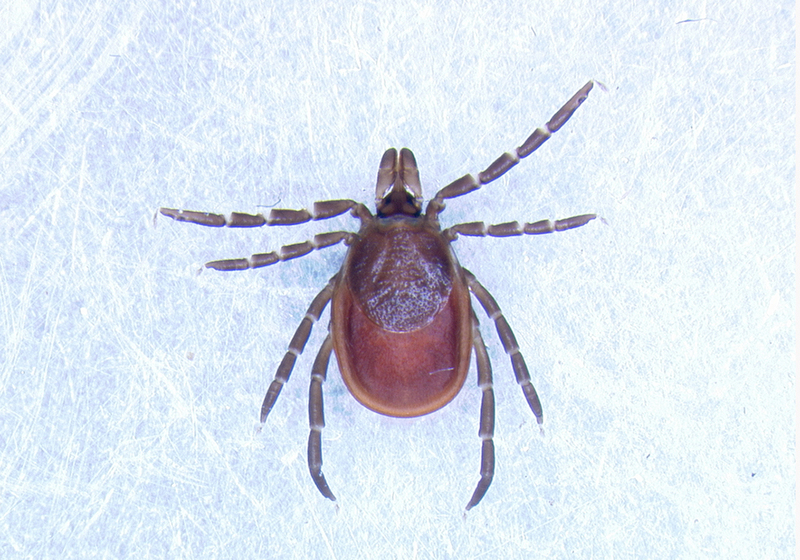 Other tick-borne diseases in the area include Powassan virus infection, ehrlichiosis, and anaplasmosis. Reported cases of anaplasmosis, which is also spread by deer ticks, have increased drastically in the last several years. The disease typically causes flu-like symptoms, but it can lead to dire complications, such as renal failure, neurological problems, and hemorrhaging, if not treated correctly. Severe cases can cause prolonged hospitalization and even death. Mosquitoes, likewise, carry a number of different diseases. West Nile virus, which often causes no symptoms but can sometimes lead to fever, headaches, and vomiting, is the most recognized mosquitoborne pathogen in Wisconsin. The state saw 47 confirmed cases in 2017. Other diseases reported in Wisconsin include the Jamestown Canyon virus and the La Crosse virus, which was discovered by researchers at UW–Madison in the 1960s and is a major cause of pediatric encephalitis. Although the Midwest center is headquartered at UW–Madison, its many partners, including universities, public health departments, clinics, and mosquito control districts, can be found in Illinois, Iowa, Michigan and Minnesota. The collaborators work together closely, communicating and consulting regularly. The regional focus and collaborative spirit of the center promises to provide mutual benefits to partners across the Midwest. For example, Illinois has seen its fair share of mosquitoes that can spread the West Nile and Zika viruses. If conditions become favorable for an outbreak of either disease in Wisconsin, Illinois could offer a lot of help in responding to those issues. UW–Madison holds a wealth of knowledge as well. As ticks move into Illinois and Michigan, researchers and public health officials in Wisconsin will be able to share their experiences and research findings with others in the region. The UW Arboretum is a microcosm for the state and the Midwest, serving as an ideal place for observing vector, rodent, and human behavior and testing new control strategies. The expertise and structure of a regional center ensures that information gleaned from areas like the Arboretum reaches all collaborators. For instance, UW–Madison researchers held a workshop on mosquito and tick surveillance, just one of several short courses that the center and its partners have hosted. The wide variety of expertise is especially important given the complexity of vector-borne diseases and their transmission. The tick life cycle provides many opportunities for diseases to be passed on because they must eat at every stage to survive. Larvae may feed on mice, birds, or chipmunks from which they can catch a disease. Nymphs might eat blood from larger animals, even coyotes and raccoons, giving them a second chance to become infected. Nymph and adult ticks can subject humans to any disease they may have picked up along the way. This complexity necessitates not only the center’s varied expertise but also an approach that blends different players and interests. To make sure that all the people needed to address emerging diseases have a seat at the table, the center approaches its work through three avenues: training, research, and developing networks with communities and public health officials. To be certain that the right personnel will be available when the next disease or outbreak arises, the Midwest center trains new experts in public health entomology, an essential part of their focus on readiness. The certificate program is non-transcriptable (students don’t receive academic credits), but participants achieve various milestones that mark their ability to respond to the threat of a vector-borne disease. They achieve state certification as pest control applicators, take online or in-person classes, conduct fieldwork, and complete training in vector identification and diagnostics. The certificate was awarded to seven people last year. The center’s investment in training has already yielded benefits. Last fall, the floodwaters that Hurricane Harvey left behind in southeastern Texas provided habitat for millions of mosquitoes to emerge in the area, thwarting recovery and raising concerns about disease. Two UW students working with the center traveled to Texas to help with mosquito control efforts. Melissa Farquhar, a veterinary medicine student, and Erin McGlynn, a medical student, were made temporary employees of a mosquito control company and spent many hours identifying the mosquitoes brought in from traps set up around the area. Along with sending public health entomologists to the front lines of outbreaks and disease threats, the Midwest center is educating new researchers to augment the information and ammunition available for combating vector-borne diseases. Undergraduates, graduate students, and postdocs participate in many different research projects as they work to identify, understand, and fight diseases and vectors. With access to its large insectary, many in Bartholomay’s lab study mosquitoes. They’re working to find new ways to control the insects. Some are studying the effectiveness of larval-stage controls while others are looking for new active ingredients for insecticides or trying to understand the effectiveness of spraying for adult mosquitoes. Just across a small outdoor courtyard from Bartholomay’s lab, Paskewitz and her team focus on ticks. 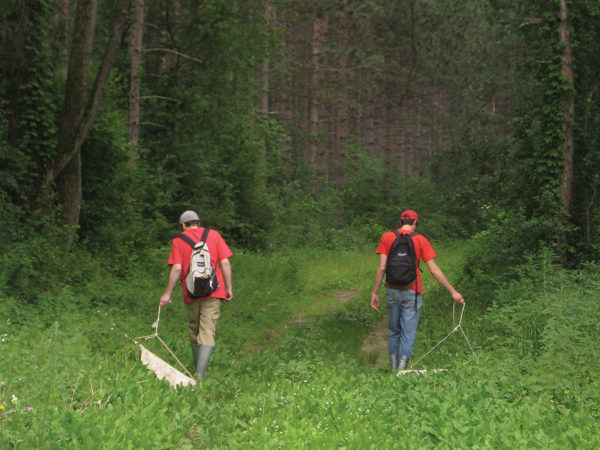 They capture the insects through tried-and-true fieldwork using “drags,” large pieces of fabric with strips or tails cut into the end that they pull through forested areas. They then collect the ticks, sometimes using a simple lint roller to get them off the drags, and bring them back to the lab for identification and pathogen analysis. In the past, variations in tick collection methods made it difficult for scientists to compare data from different labs. Some may use a drag with or without tails. They may count steps or keep track of time spent using the drag. Or they may cover the area of an entire plot. Because collection looked so different, it was hard for researchers to say that the outcome at one plot was comparable to the outcome at another. But the Midwest center is changing that. “We’re really trying to standardize tick collection here so we can directly compare data from different researchers,” Larson says. Another tool aiding the researchers is the sophisticated technology they use to identify pathogens and uncover new diseases as they arise. Called PCR, or polymerase chain reaction, the technique allows researchers to identify DNA belonging to a known pathogen or even uncover hints of new pathogens. Using PCR, scientists can reveal the pathogens that are present and possible diseases that may be on the horizon. As researchers get an idea of where the ticks live and what pathogens they harbor, they can come up with ways to reduce tick exposure and disease prevalence. Larson, who has a master’s degree in geography, hopes to develop new maps that show how the risks of diseases differ across Wisconsin. Larson and other researchers in the lab are also looking for ways to help homeowners take tick control into their own hands — and their own backyards. Studies conducted in the UW Arboretum show that tick numbers could be reduced through the use of “tick tubes,” short stretches of pipe stuffed with cotton balls coated with an insecticide called permethrin. The tubes are placed near fallen trees or logs that serve as small animal highways. When animals happen upon the tubes, they nab the cotton balls for their nests, and the permethrin transfers to their coats, where it repels and kills ticks. Tick tubes and other control strategies will become tools for public engagement as experts work to inform and involve more people in the center’s work. Larson has held training sessions and meetings with public health departments and homeowners’ associations in various parts of the state. He builds relationships with communities and finds opportunities to include them in the research process. Larson is applying these principles to an ongoing survey of homeowners’ properties in three areas in Wisconsin: Bearskin Lake near Minocqua, the Baraboo hills, and the UW Arboretum. Findings like this get homeowners interested and invested in the research. Then they can test prevention methods on their own properties and share the information with their neighbors and the center. This summer, Larson will be visiting backyards to test the tick tubes that showed promise in the UW Arboretum. “The goal of these prevention methods is to have them work at people’s homes. Now we’ll test this with the help of the homeowners to see if we can present them with a new way to avoid ticks in their everyday lives,” Larson says. A new app, launched in May, will amplify the public’s role in gathering data and developing prevention methods. Bron, the Midwest center postdoc, developed The Tick App in collaboration with the Northeast Center of Excellence and the UW-Madison Center for Health Enhancement Systems Studies. It asks users questions about their possible exposure to ticks. After a baseline survey, the app does what’s called ecological momentary assessments by prompting users to write an entry in their “tick diary” each day for 14 days. Bron wants to use this data to determine where people are encountering ticks, which tick species they are running into, and how often tick bites result in disease transmission. She plans to integrate a feature that will allow users to send a photo of a tick they’ve come across so that researchers can determine the species and tie that back to what the user was doing when it was found. In addition to data collection, Bron and her colleagues want the app to become a prevention tool. It can educate users about safe practices during tick season, remind them to use their bug spray, and send out alerts when tick numbers are peaking. And the ability to identify ticks through the app could lead to a better understanding of which ticks are harmless and which are cause for a precautionary trip to the doctor’s office. Other public outreach methods in the works include new flyers and a center website that will host up-to-date information about vectors and disease prevention. The Department of Entomology has also developed a site that can accept photos and information from users and provide recommendations based on science. Partnerships with public health officials will help get the recommendations and data out to communities and residents throughout the state. In the end, the center’s varied approach to vector-borne disease management means that residents of Wisconsin and the Upper Midwest will be more informed and prepared for vector-borne diseases and any future outbreaks. It means the next time you explore the UW Arboretum or enjoy a summer evening in the backyard, you can better understand the ticks and mosquitoes around you and how you can protect yourself and your neighborhood. This story first appeared in Grow, Wisconsin’s magazine for the life sciences.